Pulling off a birthday party is like an athletic event (or at least I imagine it to be, not actually being athletic) – I work like crazy and then crash afterward. It’s always worth it to give our boys a day to remember. 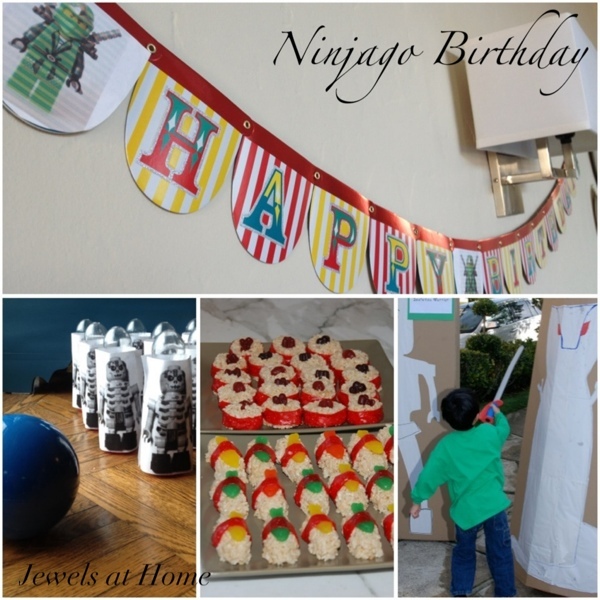 Here’s the first post on our seven year old’s Ninjago birthday party. I put details on the party activities in a separate post. I still like the feel of a paper invitation, like the ones I made for our firefighter birthday party, but sometimes the convenience of an online invitation is hard to resist. Luckily, evite has this Lego-themed invitation, and I added a Ninjago drawing by our birthday boy, to complete the look. 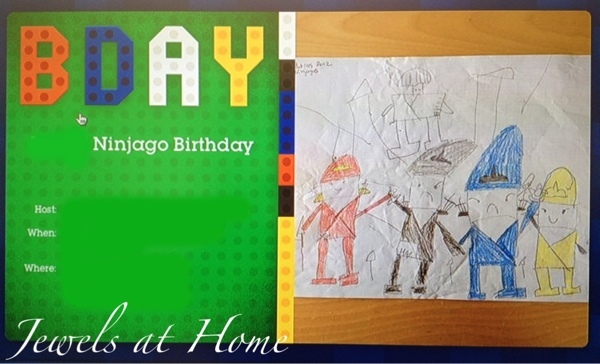 Customize an online invitation for your Ninjago birthday party. 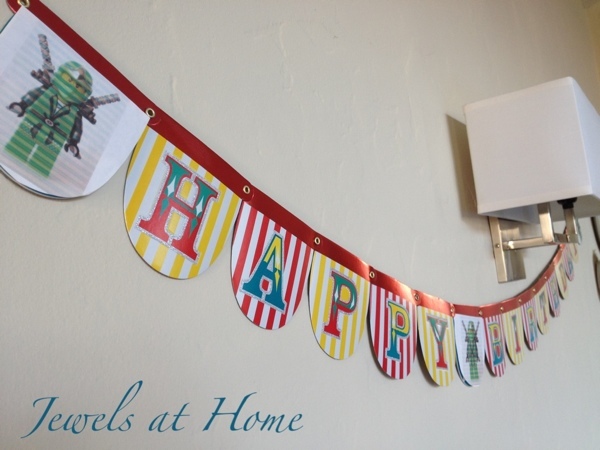 For decorating the house, I hung our reusable birthday banners, customized with pictures of green Ninjago Lloyd ZX. I had in mind to do balloons with stuck-on Ninjago eyes, but I ran out of time! I printed signs for the activities using Bonsai font and mounted them on green scrapbook paper. 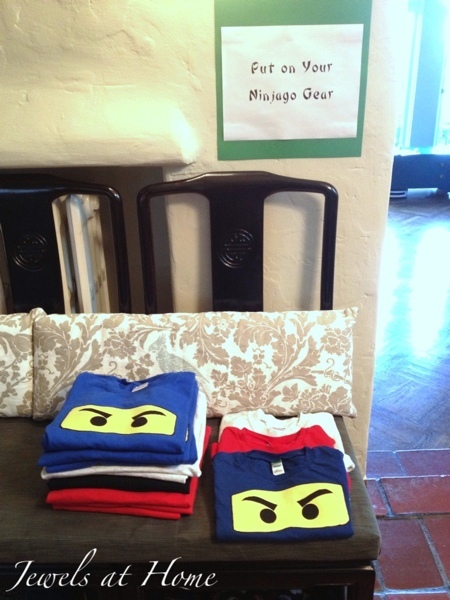 Each child got a Ninjago eyes T-shirt to wear when he arrived. This was their main party favor, and the shirts were a hit! 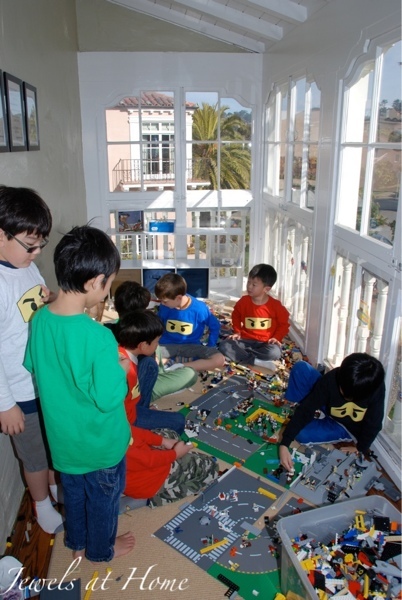 It was really fun to see all the little Ninjagos running around the house together! I failed to capture the partying kids in any decent poses – they were moving too fast! but here’s the birthday boy’s little brother sporting his custom shirt. You don’t need to make your own shirts to have great Ninjago accessories. 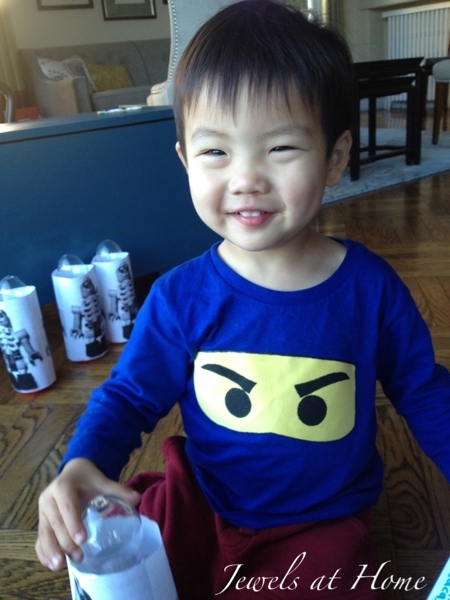 I have definitely picked up a lot of Ninjago and other Lego shirts and toys at great prices on Zulily.com! As you can see from the sign in this picture, I had wanted to arrange fruit into a Serpentine, one of the Ninjago enemies, but due to limitations of daylight savings time, I just piled the fruit on a plate, and it was all gone in an instant anyway – I told you those Ninjago are fast! 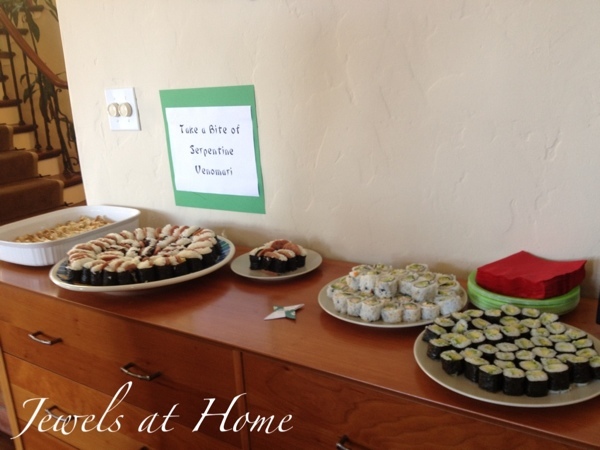 For lunch, we had a variety of Japanese and Japanese-inspired fare, including California rolls and avocado rolls from the local supermarket, homemade Spam musubi by Steve, and plenty of gyoza dumplings, which were the kids’ favorite. 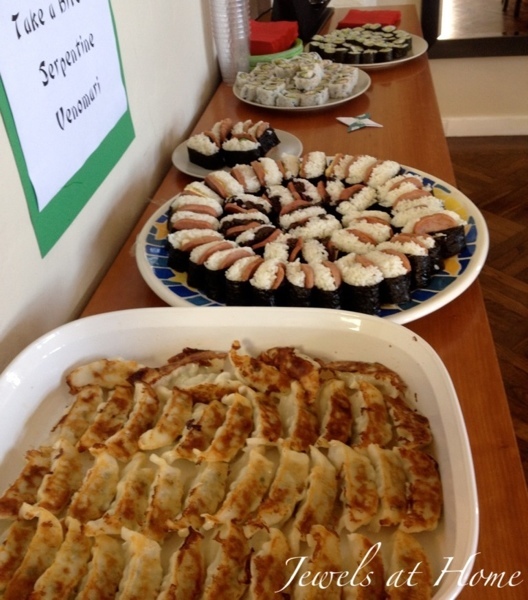 Ninjago birthdy party food: gyoza, musubi, and rolls. Instead of a cake, I made sushi using Rice Krispies. 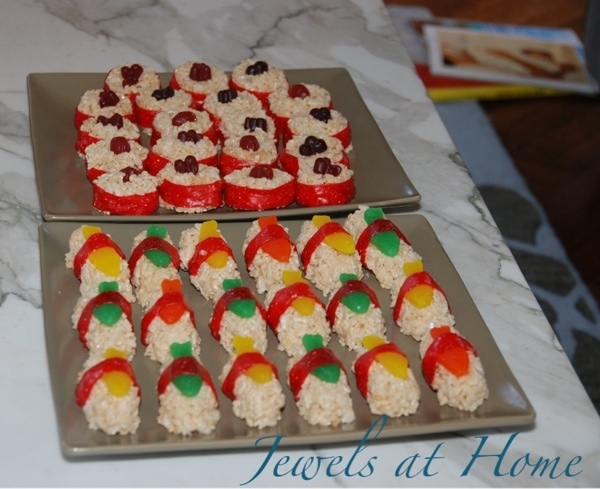 These Rice Krispy treat sushi are decorated with fruit roll-up for the “nori” and Swedish fish and fruit gummies for garnish. They were a lot of fun to make, though time-consuming. If you do it, I definitely recommend making a half batch at a time, as the Rice Krispy treats kept hardening before I could shape them all, and I ended up with several leftover globs. Rice Krispy Treat sushi made from Rice Krispies cereal, fruit roll-up, Swedish fish, and other treats. So cute! 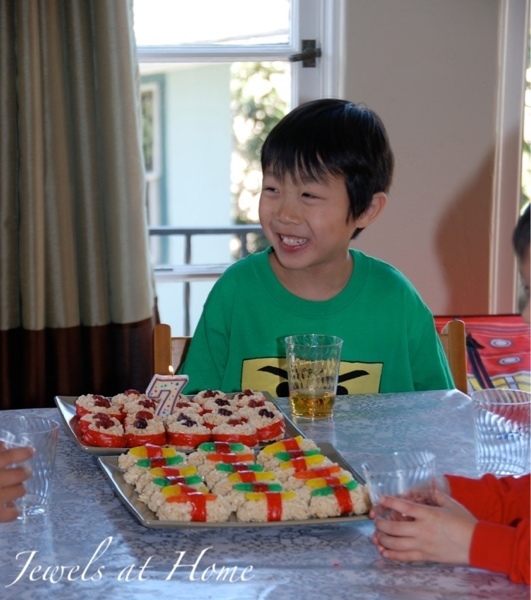 Happy birthday boy at his Ninjago-themed party! These were a blast, and you can read all the details in this post! Happy birthday to our dear son! I am glad it was such a fun day.